The United States Section of the International Boundary and Water Commission (USIBWC) has closely monitored Tropical Storm Hermine due to concerns over potential impacts to the Commission’s Lower Rio Grande Flood Control Project. 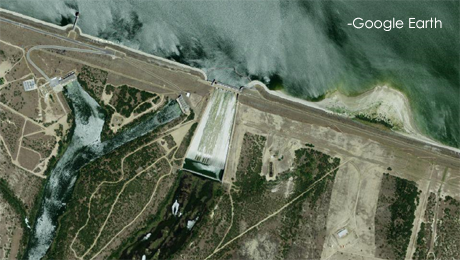 Falcon Reservoir, the major Rio Grande dam upstream from the Lower Rio Grande Valley, has been rising slowly and releases from the dam were increased to 4200 cubic feet per second (120 cubic meters per second) on September 7. Falcon Reservoir continues to have substantial capacity to store floodwaters and large flood releases are not expected at this time. The upstream dam releases as well as flow from Mexican tributaries will cause Rio Grande levels in the Lower Rio Grande Valley to rise in the coming days. Residents should note that releases from Falcon Dam were 14 times greater in July 2010 following Hurricane Alex and Tropical Depression #2. No diversions of Rio Grande flow into the U.S. interior floodway system are expected based on current releases from Falcon Dam and flows from Mexican tributaries. Drainage structures have been opened to allow local stormwater to flow into the Rio Grande and the Banker Floodway, Main Floodway, North Floodway, and Arroyo Colorado in Hidalgo, Cameron, and Willacy Counties, and the USIBWC continues to work with the local community to troubleshoot any problems with these structures. Residents in the affected region should monitor National Weather Service warnings and forecasts for information about Tropical Storm Hermine and any flood watches, warnings, and advisories that could be issued for the Rio Grande.